Properties in Draguignan Bus Station average 4.6 out of 5 stars. Property 3: At 30 minutes from the Mediterranean, a superb performance. Bastide in Flayosc (Var) ideally located between St Tropez and Gorges du Verdon. Property 11: Bastide in Flayosc (Var) ideally located between St Tropez and Gorges du Verdon. 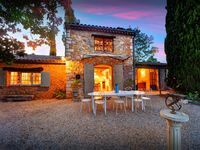 Beautiful Provencal Villa, Private Salt Water Pool, Amazing Views. 2018 Rates! Property 17: Beautiful Provencal Villa, Private Salt Water Pool, Amazing Views. 2018 Rates! Delightful provencal style villa on a single level with pool and stunning views. Property 25: Delightful provencal style villa on a single level with pool and stunning views. villa 110 m2 with pool and stunning views, not overlooked direct. Property 32: villa 110 m2 with pool and stunning views, not overlooked direct. Superb modern and spacious villa, fully equipped with pool, overlooking vineyards. Property 48: Superb modern and spacious villa, fully equipped with pool, overlooking vineyards. Spacious extremely well equipped house with lots of small detail thought of. 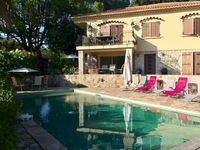 Lovely pool and summer kitchen for when we wanted to eat in and a short walk into Lorgues for croissants and restaurants. Comfortable house with comfy pool loungers. Lots of places to sit in sun and shade in the garden.